Libby's Little Addiction: Greetings and Salutations - an FCD blog hop! Greetings and Salutations - an FCD blog hop! 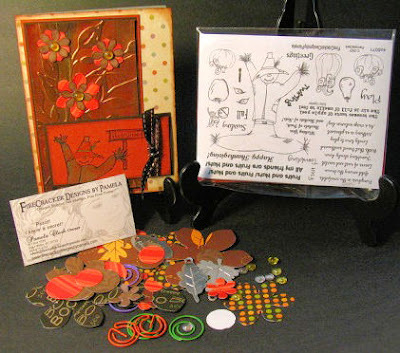 It's time for another FireCracker Designs by Pamela monthly blog hop!! This month the theme is "Greetings and Salutations!" - fitting since this is the first hop featuring the new design team! I decided to welcome them on board by making a card with Pamela's Theater Lights set, since they are the current feature now playing on Pamela's stage. LOL! I had fun masking off the admission tickets on this as I stamped it over and over. And wouldn't it be even *more* fun to go to the theater if the tickets were actually this glittery? I think so!! So you probably know the drill by now - this is a circular blog hop, which means there is no beginning and no end - just follow the links around the circle and you'll end up right back where you started. Leave comments on every blog, because Pamela will select a comment from one of the blogs to win a fun prize. Wanna know what it is? Why it's her super duper fun Tumbling Scarecrow set, and the other goodies pictured below, including Pamela's very own card from this hop! How cool! Pamela will draw the winner once this hop ends, on Monday, September 21 at 8pm EST. You can check if you've won on her blog, or she'll email you - so be sure to leave your email address with your comment. Now continue on down the hop to our boss Pamela's blog!! I loved the fun tickets. I felt like I was at the movies. boy you had a lot of patience! Great card Libs! Your card is a delight and you did so good masking all those tickets. I like this card very much. Gorgeous card, Libby! It sure has Theatre Flair all over it. FAB masking and I go with Ursula on the bow challenge!!! Libby, your card just makes me smile! Your colors, the glitzy tickets, it all screams "Broadway" to me! Oh yeah, and you actually did stitching, boy am I impressed, I don't even own a sewing machine! Like a couple others I could use a tutorial on bow tying, how about it!!?? Great, great card! This is freaking awesome! I love the sparkly tickets and I can't believe your neat sewing! Wow. Great job. I love the way you've combined the swiss dots on the various parts - very cool! Love the your card espcially the "Cinema Glitz" and the lights. Would be a great invite to movie night. Wonderful idea. What a fun card I really like it! Oooooh, shiney! I love your glitter and the bright lights of welcome. I love the colors you used on this card, as well as the entire design. The way you did the "ticket" really just pops......Another really fun creation by this new team. What a fun card!! We often give movie gift certificates or take them out to a movie and snack for gifts and this would make a perfect card to go with it!! 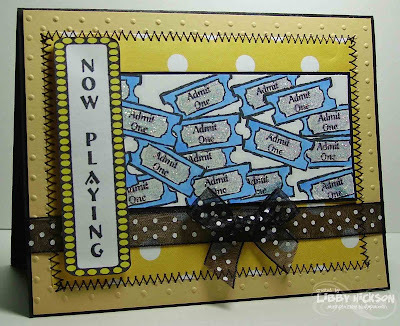 I just looove the creative way you used this set Libby! What a wonderfully detailed card! Great stamp set and beautiful card you made. This has been a fun hop; such wonderful and unique cards and great ideas. Thanks for the hop everyone! This is great with the glittery tickets - would look a lot prettier in my "to scrap" file pile too! ROFL! Great take on the "greetings" theme. Your sewing is beautiful! oh yes, I'd love to get glittery tickets...he he he....what a fun way to use that stamp too Libby! and WONDERFUL, wonderful details too!! I love your card and the set you used too. It's great! Great masking! and I love the sewing and the colors. Very pretty card.. they should make the tickets to broadway performances look like this! Great use of the image! The big show! Fun idea for a card. I love all of your cute tickets, Libby!! What a fun card!! Cute layout! I love how your used this set! Love the colors and stitching. Awesome layout! You had fun putting this together. Wow great stitching, I can't do that on clothes let along a card, lol! This is so cool, love the sewing!! What a COOL card! I Love the fun Yellow and black! Your stitching is awesome!